In one of the highest-profile North American concert events of the season, the 2009 No Doubt Summer Tour culminated August 11 with a show at the Neal S. Blaisdel Arena in Honolulu, Hawaii. Building on its successful working relationship with No Doubt lead singer Gwen Stefani from her solo tours, rental firm Sound Image of Escondido, California supplied a JBL VERTEC® line array system for the tour, which was produced by Live Nation and featured special-guest Paramore and either The Sounds, Janelle Monae or Bedouin Soundclash as the opening act. Commencing on May 3 at the Meadowlands Sports Complex in East Rutherford, New Jersey, the 2009 No Doubt Summer Tour reunited one of the most successful rock groups from the 1990s, whose 1995 release Tragic Kingdom has sold more than 16 million copies to date. In recent years, Stefani has enjoyed tremendous success as a solo artist. Sound Image supported Stefani’s previous tours with a VERTEC system, and once again specified VERTEC for this summer’s No Doubt tour. The Sound Image audio crew reconfigured the large PA system for different environments, based upon architectural considerations in each building. For typical outdoor ‘shed’ venue situations, the main PA system contained up to 15 VT4889 full-size line array elements in each main L/R cluster, with an array of eight flown VT4880 full-size arrayable subwoofers and nine to 12 VT4889 elements per side in an auxiliary cluster. Four VT4880 subs were located in the center barricade. In arena scenarios, the system featured 15 VT4889 elements for each main cluster, along with eight flown VT4880 subwoofers, nine VT4889 elements in each auxiliary cluster and six VT4889 elements in the side-facing outfill arrays, with an additional four VT4880 ground-stacked subs per side. A pair of 64-Input Soundcraft Vi6 digital live mixing consoles for FOH and monitor mixing offer digital signal path advantages with an intuitive analog-style user interface. BOSTON, Massachusetts — Boston, one of America’s greatest music cities, got a new music venue earlier this year that lives up to the expectations created by bands like the J. Geils Band, The Cars, Aerosmith, Till Tuesday and of course, Boston. Live Nation’s new House of Blues club was christened with a performance by the J. Geils Band, and 2,400 people got to hear the classic rockers with the kind of clarity and power only dreamt of decades ago, thanks to the Soundcraft Vi6™ digital mixing consoles, two of which are installed there to handle front-of-house and monitor mixing duties. The Vi6 is Soundcraft’s first large-format digital live desk and is the flagship of the widely heralded Vi Series of digital consoles from Soundcraft. Furthermore, the Soundcraft Vi6 consoles are part of a technologically advanced and sonically stunning PA system that uses components from Harman’s JBL, Crown and dbx brands to create a perfectly scaled sound system that fulfills the House of Blues’ longstanding commitment to great sound for great music. The sound system for the House of Blues Boston, as with all club systems in the Live Nation chain, was designed and installed by Sound Image of Escondido, California. The House of Blues Boston is operated by Live Nation, the largest producer of live concerts in the world, annually producing more than 22,000 concerts for 1,600 artists in 33 countries. The company sells more than 50 million concert tickets a year. Soundcraft and Studer are units of Harman International Industries, Incorporated (www.harman.com). Two 48-input Soundcraft Vi4 digital live mixing consoles perform flawlessly in FOH and monitor mixing roles. CHARLOTTE, North Carolina — The Fillmore Charlotte, a 20,000-square-foot venue at the North Carolina Music Factory’s entertainment complex in Charlotte, North Carolina’s Fourth Ward neighborhood, stays true to the tradition of the original Fillmore theaters. The venue, which opened on June 19 with Georgia acoustic rocker Corey Smith headlining, has the Fillmore’s trademark red velvet draperies, ornate chandeliers, custom lighting and vintage concert posters. The building, once an historic Charlotte manufacturing site, was reinvigorated by Live Nation, the world’s largest concert promoter, as the latest in its growing chain of clubs bearing the Fillmore name. And it also stays true to one other critical Fillmore legacy: great sound, thanks to the implementation of two Soundcraft Vi4™ digital live mixing consoles at front-of-house and monitor positions. These work in conjunction with a PA system using components from JBL, Crown and dbx, creating a perfectly scaled sound system that couples the Fillmore’s grand musical heritage with 21st century technology. The sound system for the Fillmore Charlotte, as with all club systems in the Live Nation chain, was designed and installed by Sound Image of Escondido, California. The Fillmore Charlotte is operated by Live Nation, the largest producer of live concerts in the world, annually producing more than 22,000 concerts for 1,600 artists in 33 countries. The company sells more than 50 million concert tickets a year. Now approaching its 30th year, Nottingham-based Rock City — originally set up by Director George Akins, and today probably the UK’s longest-surviving independent venue — has commissioned a brand new sound and lighting infrastructure. NOTTINGHAM, England — To keep pace with modern tour riders, and the growing move by the medium-sized venue market to offer bands the opportunity to leave their production in the truck, visiting sound engineers can now mix their acts through premium Soundcraft 64-channel Vi6 at front-of-house and 48-channel Vi4 at the monitor position. The desks were chosen by the venue’s technical manager Dave McVea, and installed by the SSE Audio Group installation project team, led by Alex Penn and Steve Dando. Ironically it was Alex’s father John who came through the club on its opening night in December 1980 when he was providing tour support for the Undertones (who were booked as the inaugural act). "One of the deciding factors was the flexibility the system gave us. We at Rock City have a wide variety of events and performers across our stage in any year so the system will have to withstand many varied demands. It is this that eventually made us choose the solution offered by SSE Sales." Although Alex Penn had provided Dave McVea with digital desk options the venue’s technical manager said that the Soundcraft desks had largely picked themselves. "I know everyone says it, but it’s just so easy to walk up to this desk. With the Vistonics II interface you have everything you need right in front of you. "I’ve always liked Soundcraft desks and for me it was a no brainer — I suggested this to SSE and they were happy to supply. Also, having only ever mixed FOH previously on the Vi series, I was doubly impressed when I tried my hand at monitors using the Vi4, I surprised myself at how fast I became on it in a short space of time." His belief was confirmed on the very first night the console was used, when American sound engineer Stephen Shaw found himself mixing Buckcherry on a digital desk for the first time — and was absolutely blown away with the speed of his learning curve. "In fact he gave it a ringing endorsement." McVea also praised the reduced footprint of the Vi6 and Vi4, giving them much more space in both their FOH and monitor positions (where they have been able to extend the stage). The Vi4 is supported by a custom 3-bay rack, containing all amplification and processing for the monitor system — built by SSE's in-house manufacturing operation, Sigma Fabrications. Although a 64-channel analogue multicore has also been provided, Dave McVea says the industry is moving increasingly towards a digital domain. What excites him and his technical team is the added efficiency and saving on prep time the Vi platform will offer — with engineers able to email their show files ahead. He also notes the possibility of recording via a MADI interface and giving bands the opportunity to be able to ‘virtual soundcheck’. "This is something we are looking at closely," he says. SSE Sales offered full two-day training on the Vi6, masterminded by Steve Dando, with Deep Purple sound engineer (and Soundcraft aficionado) Gert Sanner also assisting with time alignment. Equipping the 1900-capacity room is the latest phase in a progressive upgrade by DHP. While Rock City itself is served by two other rooms, clustered into the neighbouring estate are other DHP-owned venues such as The Rig, Stealth, The Rescue Rooms and The Social. David Davies described the move — which includes a new lighting package and other interior upgrades — as "a major step forward" which had required "a significant investment". He said, "For a long time we have wanted a system which we know compares with anything else on the circuit. It’s a vision Dave [McVea] had and it has required two years’ hard work on his part although the installation process only took three months. This is quality technical infrastructure which we can now pass onto our acts, and will put this grand old lady back on the map." For the past two years, French-language Canadian educational public television network TFO has relied on a Studer Vista 5 console for its live production needs. TFO is a one-studio shop, with all of its productions coming from the same control room, producing children’s programming, teen programming and news-style shows. In 2007, TFO embarked on an initiative to run autonomously from TVOntario. Conveniently, this decision coincided with TFO’s preparation for digital and HD broadcast, with the goal of functioning completely tapeless. With a new location, new studio, new control rooms and edit suites, the need for new (digital) equipment was apparent. Lexicon®, a Harman International Company (NYSE-HAR), today announced it has released new Windows and Mac software drivers for the I∙ONIX series of Desktop Recording Interfaces. With the new 64-bit Windows driver, these interfaces now operate seamlessly on computers running Windows 64-bit XP and Vista operating systems. The new Mac driver improves performance and now supports all Mac computers operating on OS X 10.4.9 or higher regardless of whether they are based on a PowerPC or Intel processor. The I∙ONIX series feature newly designed dbx® microphone preamps on all analog inputs. The preamps are driven by a 60V high-voltage supply to guarantee stability and deliver superior recordings across a wide dynamic range. Ultra high-definition converters ensure pristine 24-bit/96kHz audio. The result is remarkably clear and transparent inputs that will capture every subtle detail of your performance. Each of the three I∙ONIX models allows for a different level of recording capability. The U22 can record two channels simultaneously and includes two analog mic/line inputs with +48V phantom power, two balanced line outputs, a Hi-Z instrument input, a ¼” high-power headphone output, and MIDI I/O. The U42S records four analog and two digital channels simultaneously, and the U82S can record eight analog and two digital channels. In addition, the U42S and U82S include four and eight mic/line inputs respectively, stereo S/PDIF, two instrument inputs, and two ¼” headphone outputs. Each interface is bundled with Cubase LE 4 and the Pantheon II reverb plug-in, providing everything you need to start recording. Although the Swiss Exchange is firmly rooted in Switzerland’s financial center, the SWX pursues a strategy focused on international activities. The seven-year-old system they had before the installation was inadequate from the start and in need of a complete upgrade, from the microphones to the control system. An AMX touch panel was added for controls, and new loudspeakers were put in for multimedia presentations. With the new system in place, orders can be executed, cleared, settled, and confirmed with a single click. Succeeding in a fixed installation that provides a major upgrade to the quality of its networked audio, London nightclub Fabric has chosen to upgrade its three legendary dance rooms with BSS Audio Soundweb London devices. The system was sold through Harman’s UK distributor Sound Technology Ltd.
“The original Soundweb devices gave us great service but we realized that the available technology had become far more advanced. Processing speed is a lot faster, and the new devices have a much greater capacity,” stated Sanjeev Bhardwaj, head of technology for Fabric. “Anything I can do on my laptop I can do on the BLU-10. We have set up separate gain controls for each individual speaker and have reset the crossovers with the result that the system provides us with amazing performance like we’ve never heard it before,” stated Bhardwaj. “We have maintained the highest standards in each room and with so much more processing power available the system is no longer straining. We are also able to run it quieter than we did before — and yet it sounds better. Our regular DJs have been quick to remark on the improved sound,” stated Bhardwaj. Although other options were considered for the upgrade, Bhardwaj believes Soundweb is still the most efficient and powerful system available. 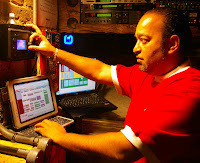 “The idea of the new Soundweb London and its digital audio bus was to future proof the club. I have so many spare outputs and we are still only using 56% of the processing power in Room 2. In fact it’s the best money I’ve spent in the last three years and I probably won’t need to look at processing again for the next decade.” stated Bhardwaj. In a fixed installation that demonstrates the reliability and versatility of AKG’s wireless systems, the Northbrook Theater in Northbrook, IL, selected the AKG DMS 700 to play a role in all 12 annual productions held there. The 300-seat theater upgraded to the DMS 700 last month, selecting an array of AKG equipment that included 12 DSR 700 receivers, 10 CK 77 Microphones, and 25 DPT 700 bodypacks. The theater will be using AKG’s digital wireless system to drive a series of performances put on by youth, for youth. Performing Arts Supervisor Kurt Ottinger needed a system that came complete with battery life indicators on all receivers, frequency scanning with error indicators and the ability to synchronize receivers with the transmitters. Additionally, with the encryption function that comes standard on every DMS 700, the system is able to offer Ottinger's productions the necessary security for sensitive audio transmissions. And with its ultra-wide tuning range he can operate up to 100 channels simultaneously, allowing each production to include as many performers as needed. One feature of the AKG DMS 700 that is unique is that its digital audio transmission is able to eliminate distortion and noise and alleviate bad audio performance resulting from low RF link quality, which is one of the major reasons that Ottinger selected it. Having previous experience with the AKG WMS 4500 led Ottinger to continue on with the new digital DMS 700 system, knowing the premium audio quality and ease of use that comes with AKG products. In a move to provide professional audio customers and dealers in the India market with comprehensive sales and support services, Harman Professional today announced the appointment of Hi-Tech Audio Systems as the authorized distributor for India effective July 1, 2009. According to Harman Professional Regional Sales Director Sushil S. John, today’s announcement underscores Harman Professional’s commitment to evolving and improving its service of the professional audio community in India. Headquartered in New Dehli with satellite offices in Noida and resident engineers based regionally throughout India, Hi-Tech Audio Systems was established in 1990 by PK Gupta, Director and Rajan Gupta, Director. Hi-Tech Audio Systems’ award-winning team of 65 engineers and executives is highly experienced in the Indian professional audio market, having led many major fixed installs, live sound and recording and broadcast projects and also having previously served a host of other leading manufacturers. “As India’s creative community continues to export high-quality, lasting content, the professional audio community here is pushing new boundaries in cinema, post production, recording and live sound. Harman is committed to supporting the community with new products that are similarly innovative and high-performing and in Hi-Tech Audio Systems we have found a strong and capable partner,” John said today. David McKinney, Harman Professional’s Senior Director of Sales for Asia concurs, “We are working closely with Hi-Tech Audio Systems right now to restructure our dealer network across India to ensure we cover every state and provide a high level of both sales and technical support across India. This is the first step in a number of positive changes and enhancements we will be implementing with Hi-Tech Audio Systems,” McKinney noted. The appointment of Hi-Tech Audio Systems follows the recent opening of Harman International offices in Bangalore. For the finest and most beautiful concert hall in the world, only the best will do, which is why Vienna’s Großer Musikvereinssaal has developed an assortment of AKG microphones to provide unmatched sound quality. The Großer Musikvereinssaal, known to many as the Golden Hall, is home to Vienna’s Philharmonic Orchestra and the Orchestra’s famed annual New Year’s Day Concert. With a worldwide television audience tuning in every New Year’s Day since 1959, the world-renowned architectural acoustics needed more; they needed a fully stocked sound system complete with AKG C 12 VR’s, K 702’s and WMS 400 wireless system. The Golden Hall is more than just a concert venue; it also hosts numerous lectures and public readings. Because it handles so many types of public events, there is a need for a high-quality sound system that is met with four channels of the AKG WMS 400 wireless system. A mobile lectern has been equipped with a CK 33 capsule on a modified GN 50 gooseneck that can also be connected to a bodypack transmitter to eliminate unnecessary extra microphone cables, which allows for optimal sound as well as good space conservation. All of the microphones are controlled by an AKG AS 8 automatic mixer and monitored by AKG headphones using the K 207 reference. Much of the musical experience at the Golden Hall can be attributed to the design of the building itself. A hollow space under the wooden floor creates a resonant background; the ceiling, which is made of wood, is hung from the rafters and gives the sound in the hall extra dimensions; and the ceilings, balconies, and caryatids provide ideal propagation of sound waves. Since the first concert was held on January 6, 1870, the Golden Hall has represented the finest in acoustics, garnering praise from architects, musicians, and fans from all over the world. The C 414 stereos are selected by AKG’s sophisticated computer-aided matching method, which results in the highest possible correlation over the whole frequency range and virtually identical sensitivity for stunning, three-dimensional recordings. Other AKG equipment used in this project include the C 414 B XLS/ST, the C 414 B XLII/ST, the SR 400, and the GN 50, among others. Reinforcing its position as the leading amplifier technology manufacturer for professional sports arenas, Crown CTs series amplifiers and PIP-Lite modules were deployed for the redesigned sound system at Camden Yards, in Baltimore, Maryland. 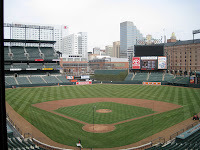 Home to the professional Major League Baseball team the Baltimore Orioles, the 48,000-seat stadium, opened in 1992, has received consistent praise as one of the best ballparks in the country. Sound integrator AVI-SPL performed the installation, which also included BSS Soundweb London signal processing devices. “When you’re dealing with a project of this magnitude, you’re constantly looking at the solution on a large scale. We need to know that the individual components will work together seamlessly and perform with the highest level of reliability. With Crown you’re know you’re going to get that consistently,” stated Will Parry, senior vice president, large product group at AVI-SPL. “With the CTs series amps paired with the PIP-Lite modules you get unmatched performance and value. We continue to use Crown in professional sports arenas across the country because these amps are built with these types of installations in mind,” stated Parry. Other Harman equipment installed includes BSS Soundweb London BLU-320, BLU-160, and BLU-120 devices. “For signal processing BSS provides the best solution for a network of this size. Plus, networking a system using Harman HiQnet™ System Architect™ is a given in a system of this size,” added Parry. Audio integration firm Daktronics-Sportsound recently upgraded the sound system at Washington-Grizzly Stadium at the University of Montana, home to the University’s Division 1 football team. The new system at the stadium features JBL VLA line arrays and PD Series loudspeakers. Home to the Montana Grizzlies college football team of the Big Sky Conference, Washington-Grizzly Stadium opened in 1986 and has undergone several expansions since then. With the most recent upper deck expansion of 2,000 seats, the Stadium currently holds 25,203. Daktronics-Sportsound installed 12 VLA601-WRC 3-way, full-range, weatherized line array loudspeakers, arranged in two columns of six each, mounted to the end zone scoreboard. The system also includes four PD764-WRC weatherized loudspeakers. A total of 30 Crown XTi amplifiers power the system. “The installation of the system went like clockwork and the incorporation of the speaker cabinets into our existing scoreboard structure worked very well from both a functional and aesthetic standpoint,” said Chuck Maes, Associate Athletic Director for the University of Montana. 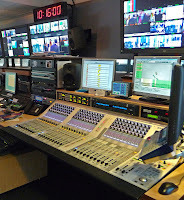 International news and current affairs TV station, France 24, has purchased three Studer Vista 5 consoles — all of which have been installed over the past two past months. With over three million judges tuning in to select the winner of the Serbian equivalent to American Idol, singer Darko Lazic turned to AKG’s industry leading vocal system to help him stand out as the Grand Star of Zvezde Granda. The final night of competition, which was held on June 20th at Belgrade Arena in front of a live audience of 18,000, was sponsored by production vendor Studio Berar and fully stocked with AKG’s rugged sound systems. Auditions for Zvezde Granda began in September, with judges and producers visiting locations throughout all of Serbia. By June, the TV audience had narrowed the competition to seven contestants, all of who competed for the grand finale using AKG WMS 450 wireless microphones. The WMS 450 is a highly flexible wireless system that features perfect audio transmission. It provides cost effective, high-performance solutions for situations where several radio microphones will be used simultaneously, which was exactly the case for the show’s grand finale. In addition to the WMS 450, Studio Berar also used AKG’s WMS 40 Pro Flexx. The WMS 40 Pro Flexx comes with a rugged handheld transmitter and is extremely easy to use. It fulfills the highest esthetic requirements and comes with transmitters that operate for 30 hours off a single AA size battery, which is great for conserving battery power and limiting replacement costs. Zvezde Granda is organized by the Grand Production record label and broadcast live on commercial television throughout the Balkans. Regional production service vendor Studio Berar, which is responsible for full production on the final night, also provides additional lighting and video for the show throughout the season. In addition to providing production assistance, Studio Berar is the sole contributor of all AKG pro audio equipment that is awarded to the contestants as final prizes. 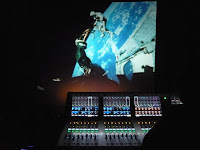 Former Roxy Music member Brian Eno celebrated the 40th anniversary of the Apollo 11 moon landing, by introducing the first of two live performances of his 1983 composition Apollo: Atmospheres and Soundtracks in the IMAX Cinema at the Science Museum in London. Mark Hornsby’s company Headtec were appointed by the Science Museum to provide the sound, and Icebreaker’s FOH sound engineer Alexander Bossew requisitioned a Soundcraft Vi6 digital console as his first choice. However, the composition adapted by Jun Lee, required the use of a lot of reverb. “The IMAX is completely dry and I had to use six different internal Lexicon reverbs, which sounded excellent,” he said. That task alone consumed most of the one-hour desk programming time that was allocated. Unsure up to the last minute whether his favourite desk would be made available Alexander failed to order a MADI soundcard — something he deeply regretted. Delivering a new level of affordability coupled with unprecedented performance, JBL is now offering its standard-setting PRX500 Series portable PA loudspeakers at a lower price, making the PRX500 Series the most powerful and high-performance system at its price point. “With the refinement of the PRX500 Series’ pricing structure, every musician, DJ, venue and audio/video provider can experience high-performance, self-powered speaker systems with a degree of simplicity unmatched by competitive systems,” said Simon Jones, Director of Marketing for Portable PA, JBL Professional. The PRX500 draws from JBL’s 60 years experience of the world’s leading loudspeaker engineering and Crown’s 40 years experience of designing and producing unmatched amplifiers. The fusion of these two brands truly makes the PRX500 Series much more than the sum of its parts. The PRX500 Series includes JBL Differential Drive® transducers and state-of-the-art Crown Class D amplifiers, delivering high power and performance at approximately 30 percent less weight than competitive products. In fact, two PRX500 speakers deliver more performance, power and clarity than four speakers from competitive systems. Neodymium Differential Drive transducers provide high sound pressure levels with minimum distortion and power compression. The PRX500 Series has established itself as the most versatile powered system in its class. They are incredibly light, delivering the highest performance-to-weight ratio in their class. Dependable and road tough, they’re covered with JBL’s DuraFlex™ and heavy-duty, foam-backed steel grilles. Crown integrated digital amplifiers power the PRX500 Series. Lightweight, compact and multichannel, Crown amplifiers offer more power than competitive systems and include sophisticated DSP for EQ, crossover, system control and protection. For more information on the PRX500 Series visit www.jblpro.com; for detailed information on the new prices contact your JBL dealer. This summer, London-based sound engineer Harry Bishop has enjoyed tremendous success providing live audio systems for a variety of festivals in England, including the One Taste festival in Hyde Park and several festivals in association with Chai Wallahs, an organization dedicated to providing an eclectic blend of high-quality musical acts, coupled with an emphasis on healthy alternative lifestyles. At the heart of Bishop’s success is the Soundcraft Vi6™ console, which has helped him confidently make the conversion from analogue to digital during the hectic festival season. At the One Taste festival, Bishop deployed Soundcraft Vi6 consoles at the front of house and monitor positions. “We decided to use them in part to compare them to their analogue counterparts in terms of operation and sound quality,” Bishop says. Christian Bailey, monitor engineer at the One Taste festival, concurs: “It was a pleasure to use the Vi6 for monitors at the One Taste festival in Hyde Park,” he says. “The board was simple to set up and although we were very pushed for time, with a quick line check for each band all the mixes were dialed in fast and musicians were soon smiling. The sound quality was excellent and the vocals sounded smooth and natural. The Darmstadt Staatstheater (National Theatre) in Germany is a multipurpose four-section arts centre, dedicated to opera, ballet, musicals and drama. In 2004 it underwent a major redevelopment at the hands of Waagner-Biro and when it reopened in September 2006 it revealed not only a new entrance and foyer, but an entire technology infrastructure including a new stage and control system, based around a Studer Vista 8 digital mixing platform at the front of house position. The 52-fader Vista 8 is accompanied by a 20-fader remote desk, which can either be used in the hall or as an extension elsewhere. In addition, more than 60 Crown CTs amplifiers were installed, with PIP modules in the output stage, centrally controlled and monitored via the Harman HiQnet™ System Architect™ control interface. This allows control of the amplifiers from the mixer, and the settings of the amplifiers to be called up as snapshots in the Vista 8 — opening up new communication possibilities between the mixer and peripheral audio technology. The clients were so delighted with the flexibility and reliability of the Studer 8 — providing a control universe of 550 inputs and 480 outputs — that when they came to equip their recording studio recently, they opted for a Vista 7. They knew this would ease workflow by keeping control within the same operating environment, but there was also one other important aspect, which helped drive the sale. For both the Vista 8 and Vista 7 can now be connected using Studer’s new RELINK Resource Linking I/O Sharing System, which enables the sharing of resources in both directions. Christoph Keller was the project leader for Audio Pro Heilbronn, Studer’s German distributor, which was responsible for both console sales: “This was an important development, due to the fact that this is a new technology offered by Studer, and was only launched at last September’s IBC Show. This is one of the first installations where this technology has been used,” Keller said. 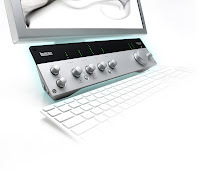 The Vista 7 was specified with 42 faders; Dual Joystick Integrated matrix with 400 inputs and 340 outputs: 96 microphone inputs; 24 analogue inputs; 72 analogue outputs; 32 AES In- and Outputs; Aviom Interface for Personal Monitoring; three MADI Interfaces for Digital Audio Workstation. Largely dedicated to opera, the main concert hall has seating capacity for 956, with another eight seats in the disabled area. The smaller auditorium, predominantly for drama and dance performances, can house 482 spectators, while a new 130-capacity studio theatre was built during the 2006 renovation. The engineers of the National Theatre are particularly impressed with the Studer Vistonics™ operating concept, the networking over HiQnet and the ability to link and share the desks’ resources. From a practical point of view this allows very fast working within the console environment, they say. A Studer Vista 8 is at the heart of a new concert hall at Dresdner Hochschule für Musik (Dresden University of Music) in Germany, named after the famous 19th century composer, Carl Maria von Weber. The building was designed over a two-year period to the highest architectural and acoustic standards so that all forms of amplified and unamplified music — from chamber music to full-on rock music — could be optimised. In order to fulfill these exacting requirements, the University turned to a Harman solution, consulting its German distributor, Audio Pro Heilbronn. The Studer Vista 8 console was recommended in view of its flexibility and portability, providing the ability to be used in different locations and for different purposes. For although the 450-seat concert auditorium forms the centerpiece of the new building, it is annexed by a separate opera rehearsal stage, a library and other practice areas. For full signal distribution and routing throughout the complex, the Vista 8 is used in tandem with a Studer D21m I/O system, which provides cost-effective inputs and outputs with maximum flexibility, providing full 96 kHz functionality. The main Vista 8 itself is equipped with 30 faders and is situated in the main control room. From here the engineer can control all the inputs and outputs for the live sound and for the recording sessions. In addition, a 10-fader remote console is available, which can be used either in the control room as an extension to the main desk or as a remote in the auditorium. 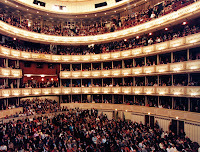 Auditorium control is useful in setting the balance between the orchestra, and the effects of the amplification on the architectural acoustics of the building. The central DSP unit of the mixer system, the SCore Live with five DSP cards, is housed in a technical area along with other components. The exchange of audio and control data between the central processing unit, the D21m I/O-modules and the desks is made by a redundant fiber optic network. Two D21m’s are inserted beside the stage, and a further four are housed in the technical room, providing flexibility to move to other positions as required. In total 96 analogue inputs and 88 analogue outputs are available. Audio effects are provided from an external computer and this merges with the desk’s VST Plug-in capability, so that apart from playback and recording equipment — such as Tascam X-48 hard disk recorders — further audio devices are unnecessary. The transmission of the audio signals to the sound studio in the old building is also made by glass fibre. An RME ADI-648 multichannel audio digital Interface offers format conversion from MADI to ADAT (and vice-versa) ensuring that data between the Pro Tools HD recording system in the studio and the Studer system in the new building can be exchanged. Today more than 600 young people study music from all over the world in Dresden across an unusually broad spectrum. And the Studer Vista 8 platform will help them achieve their ambitions to the maximum. In a unique fixed installation where high performing sound systems are critical, North Shore Cinemas, a Marcus Theatres® Cinema in Mequon, Wisconsin has chosen Crown I-Tech HD amplifiers to power its UltraScreen® theaters. The theater is the first to deploy I-Tech HD to power its audio systems. Mark Collins, Director of Projection Technology for Marcus Theatres, explained the decision to go with I-Tech HD’s for this environment was a logical choice. “I know that a lot of the technology in the amplifier was built with the tour sound market in mind. However, I think this type of application is even more demanding than having the equipment on the road because the amplifiers are constantly running. For cinemas you need power and reliability. These amps give us a ton of headroom and with Crown you know you are getting a great product,” said Collins. The move to I-Tech HD also proved to be cost-effective because the additional power means each theater needs fewer amplifiers to power the system. “For one theater it doesn’t work out to be a huge savings but when you are outfitting multiple venues, it can really add up over time. The plan is since we have seen how well this works, we will continue installing I-Tech HD’s in other venues as well,” added Collins. From an installation perspective Collins felt the process was seamless. “We set the amps up with no assistance at all. We basically hooked everything up and turned them on, it was that simple in terms of set-up,” said Collins. Collins believes the results of this project speak for themselves. “From a sound perspective, there is a noticeable performance difference even to the average person who walks in the theater. I think that speaks to the quality of this system,” said Collins. The amplifiers power a JBL sound system consisting of three ScreenArray® 4732 loudspeakers, six 4642A subwoofers, eight AC2212 loudspeakers on the side walls and two AM4215 loudspeakers for the back wall. I-Tech HD features a new user-inspired DSP engine co-developed with BSS called OMNIDRIVEHD. The new processing engine features Linear Phase FIR filters that offer unrivaled crossover performance for sonically pure tunings. The OMNIDRIVEHD processing engine also features an innovative new suite of limiters called LevelMAX™. Harman HiQnet™ System Architect ™ mirrors the typical browser navigation interface to provide contracting professionals with a familiar interface to access a host of power configuration and control functions. Regional live event production company SLS Productions recently provided a JBL VERTEC® line array system for the 3-day, fourth annual Dubai Bike Week celebration. The festival, which drew more than 25,000 visitors, motorcycle lovers and Harley-Davidson club members, was capped off with a concert by the iconic hard rock group Deep Purple. Event promoters Live Nation and MECOM contracted SLS Productions to provide the sound, lighting and video systems for the event. Held in Festival City, Dubai Bike Week featured the latest in motorcycles, ATVs, apparel, accessories, custom-designed bikes and motorcycle-related products from major international brands from Europe, the United States, Canada, Italy and Japan. In addition to Deep Purple, other entertainers included the Scorpion Customs stunt team, DJ GQ and his stunt team of bikers, as well as local bands including Juliana Down, Abri, Lumi, The Meerkats, Paul Akiki and Jonas Desai. The PA system included two main array hangs, each containing 16 VERTEC VT4889 full-size line array elements, supported by 48 ground-stacked VT4880A full-size arrayable subwoofers below the main arrays. An additional two stacks of two VT4888 midsize line array elements each served as the center fill system. Crown I-Tech and Macro-Tech Series amplifiers powered the loudspeakers. No matter where you are—on tour, in the studio, at a venue or home—interacting with Harman’s two console companies has never been easier thanks to the recent launch of a range of online facilities and social networking sites. The new tools help you get the best out of your audio system, or for those who haven’t used a console before, how to choose the right one and instant training on how to use it properly. The new Studer website, www.studer.ch , features whitepapers on Mixing in Surround, Virtual Surround Panning, and how to measure the true quality of sound. A series of tutorial videos can be downloaded explaining and demonstrating operational philosophies of the Vista digital console range. With Studer’s product range now spanning more audio markets, the site also features application-specific areas for broadcast, live sound, theatre, performing arts centres and Houses of Worship, with dedicated news sections and product recommendations. Soundcraft’s new site, www.soundcraft.com , features a comprehensive selection of tutorials including the acclaimed ‘Guide to Mixing’ available in download booklet form as well as video streams, while white papers provide help for all levels of user; beginners looking to do their first gig on their first mixer, right up to the top pro’s operating tours, shows and studios with the most advanced digital systems. Topics start with how to cable up your mixer, through to Audio Balancing, Matrixes, LCR Panning and VCA Grouping. The Video Vault contains demonstrations ranging from the Analog MFX family right up to the Si and Vi Series digital, large-format consoles; user testimonials provide an insight as to why engineers love using these consoles. Soundcraft’s range is very broad and addresses several markets, so a new customer often needs some help in choosing the right product to look for before talking with a representative or dealer. This is where the Product Matrix earns its keep: using a simple drop down menu system, enter the key features you want on your mixer, the type of application, and presto! Out pops a range of options for you to look into in more detail saving people hours of browsing time. Audio aficionados will also enjoy Soundcraft and Studer’s ‘back catalogues.’ With almost 100 years audio experience between these brands you know there’s going to be a legacy of great products and the good news is they are all there to see and read about in the archives on both sites. Look back at Graham Blyth’s first ever flight-cased Soundcraft Series 1S built in 1974 specifically for the early touring bands, or the legendary Studer J37 eight-track tape machine, which during the 60s and 70s, was essential equipment to be found in most of the world’s top recording studios including Abbey Road, where it was used by Geoff Emerick and George Martin to record The Beatles’ Sergeant Pepper’s. To help users share information and pick up tips of the trade from one another, Soundcraft has just launched its own fans page on Facebook at www.facebook.com/soundcraft , where fans can also pick up latest news, pictures and information, and also upload their own Soundcraft-related news and photographs. This supplements the existing YouTube channel, www.youtube.com/Soundcraftuk , which already hosts all the chapters of the respected Soundcraft Guide to Mixing. A new MySpace site, www.myspace.com/soundcraftxx , is another way for users and musicians to get closer to their favourite mixer news and showcase their own bands. Hitachi Home Electronics (America), Inc., Business Group, continues to lead the way in providing end-users with networking capabilities with the introduction of the new CP-X3010N 3LCD projector. Hitachi addresses the growing demand for networking technology with tools that lower the total cost of ownership as a result of added convenience, security and ease of operation. The CP-X3010N offers unmatched performance and convenience, with a brightness of 3,000 lumens, a 2000:1 contrast ratio and networking capability. The CP-X3010N features 16 Watts of built-in audio, eliminating the need for external speakers, while maintaining a low noise rating of 29 dBA in Eco Mode. Additionally, the CP-X3010N features a long lamp life of 3,000 hours in Standard Mode and 6,000 hours in Eco Mode. The CP-X3010N also features Hitachi’s proprietary My Buttons functionality, allowing two programmable buttons on the projector to execute any projector command. The CP-X3010N also offers input Source Naming, allowing users to rename input sources to fit their needs. Closed Captioning functionality is also available with the CP-X3010N. Alongside the introduction of the CP-X3010N, is the release of Hitachi’s Projector Management Application (PJMan) Version 7. This proprietary technology provides the functionality to control, diagnose and manage an individual or group of Hitachi projectors from a single location. The ability to produce queries and reports in real time is a new feature of this latest version, providing AV/IT managers with the ability to gather real-time and historical data to analyze projector usage and produce call tickets. PJMan’s advanced email, report and scheduling capabilities contribute to the lowest cost of ownership in the industry. Additionally, Hitachi’s Projector Control Application (PJCtrl) allows a user to control the functions of their Hitachi Projector through a toolbar on their desktop or laptop PC. Since all of the functions for controlling the projector are on the PC, PJCtrl helps to reduce costs associated with lost remote controls and battery replacement. Users can control up to five of the same Hitachi projectors simultaneously and can be customized to suit the user’s individual preferences and needs with PJCtrl. It also has an advanced control menu that is ideal for installation and maintenance. Depending on the projector model, users can control Hitachi projectors via a direct RJ-45 connection, an 802.11 b/g wireless connection, or an external Ethernet-to-Serial device. With the importance of campus security, Hitachi’s proprietary My Image functionality allows AV/IT administrators to transfer still images, such as emergency alerts, from a PC to each projector on the network. 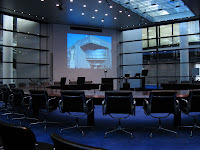 When the My Image function is utilized, the images are automatically displayed on all the projectors, including the projectors that are not in use at the time. This is ideal for applications in which multiple projectors are networked across a large space, such as a school, campus or large corporate environment. My Image is ideal for sending presentation images ahead to a projector, sending morning announcements to rooms on campus or sending important notifications. Also, Hitachi’s Projector Messenger Application (“PJMessenger”) software allows an administrator to send real-time (or stored) text messages that appear on the screen of the projector. This is ideal for sending campus wide announcements and important notifications. When used in conjunction with the scheduling function, notifications can be shown at preset times, making each screen a virtual message board.